Meet the monkeys states that after extensive training, each monkey is provided with lifetime medical care overseen and paid for by Helping Hands. “All together, the cost to raise a monkey from birth through training represents a $38,000 investment,” but Helping Hands does not charge the recipient even a dime. Here are the Monkey Helper recipient guidelines. Most of the equipment used to communicate with a monkey is attached to an electric wheelchair. Also very important is the need for independence and the desire for companionship. Enthusiasm is very important, such as taking control of one’s application process. So if you or someone special in your life might benefit from a Helping Hand Monkey Helper, go ahead and apply! 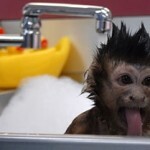 Other people with disabilities apply to help teach the monkey and act as a foster home. Why not have a cute and very unique helper-companion?